By 2020, Kia thinks it can increase fuel economy across its lineup by 25 percent. That’s the goal. If the brand has any shot at actually achieving that moonshot, cars like this — ones that wreck the gas-mileage bell curve — will have to be a huge part of the plan. The Optima PHEV plug-in hybrid electric vehicle is rated for 103 MPGe, or “miles per gallon equivalent” in federal bureaucrat speak. Theoretically, though, if you keep it plugged in and take short trips, you can completely avoid burning gas in this car by running it in electric mode and relying on battery power. Kia claims it has an all-electric range of 27 miles, which is more optimistic than I got in my real-world, lead-foot-driving tests. Still, the possibility of darting to the grocery store and dropping kids off without burning fossil fuels is a budgetary and environmental miracle. After the electric power runs out, the Optima PHEV can continue to drive on dinosaur juice with its 2.0-liter, four-cylinder gasoline engine. In gasoline-only mode, it’s rated for a still respectable 40 mpg in combined city and highway driving. OK, so those are the numbers. What’s it like to drive? As a whole, it’s surprisingly uneventful. While many electric cars have a flair for the dramatic, with oddball styling, flashy digital graphics and science-fiction sound effects when you open the door, this one takes a more low-key approach. Despite the grad-school engineering lesson taking place under its sheetmetal, it both looks and drives a lot like the standard Optima. 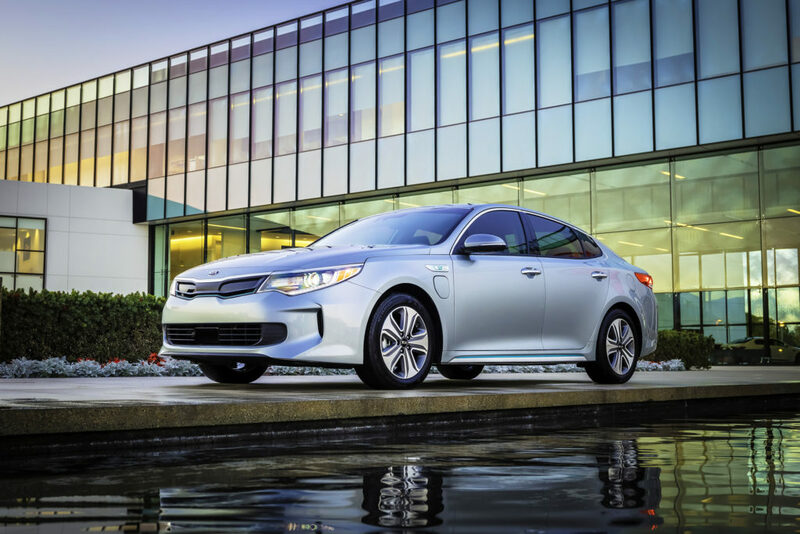 Kia’s new Optima PHEV is a plug-in vehicle that can run purely on electric power for up to 27 miles. After that, a gasoline engine extends its range for a total of more than 600 miles. It delivers good power for passing and a reasonably quiet interior. And while it eschews the Lucasfilm styling of the Toyota Prius and Honda Insight, it’s still a sharp looking car from most angles. It even gives off the air of a luxury car with lots of chrome and sleek lines in places. With a price approaching luxury territory, that makes perfect sense. It starts at $35,210. My tester, after being loaded up with lots of technology upgrades and fancy pearlescent paint, rang up closer to $42,000. The tech in this car is truly impressive, starting with the near-silent whirr of its electric motor. It makes 50 kilowatts, which is 42 percent more than the old Optima Hybrid, and you can sure feel it when you step on the “gas” pedal and sense an instantaneous rush of smooth torque. Press hard and fast enough, and the gasoline engine will also fire up to add its 154 horsepower to the mix and help you accelerate faster. The complex transition from electricity to gasoline, including routing power through a six-speed automatic transmission, is a blissfully seamless process from the driver’s perspective. 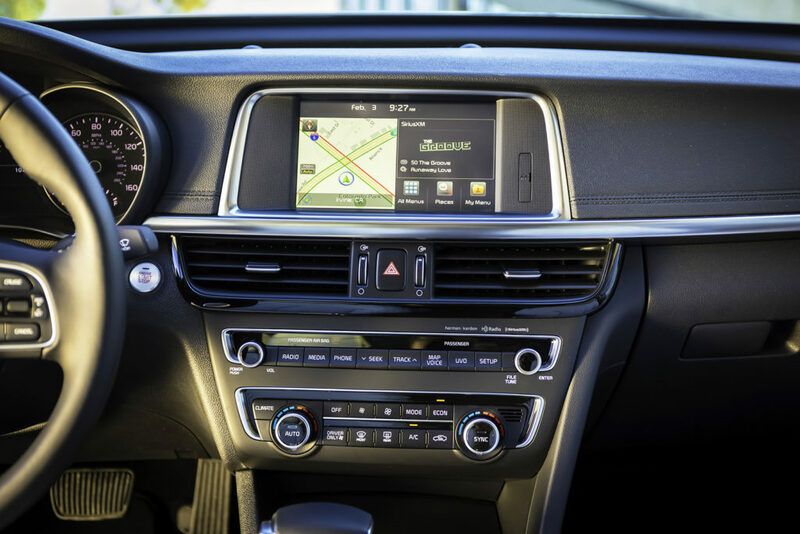 The Optima PHEV’s cabin has a digital touchscreen but otherwise doesn’t convey the same over-the-top, space-age look some other hybrids attempt. In-car technologies check all the right boxes, too, but were unfortunately bundled in a pricey EX Technology Package that added $5,250 to the cost of my test Optima. For that money, you get a long list of premium features, including a gorgeous panoramic sunroof, LED headlights that turn with the steering wheel, heated and ventilated front seats, automatic emergency braking, lane departure warning, and my personal favorite, Advanced Smart Cruise Control that keeps a set distance from the vehicle in front of you. Super-duper-efficient cars like this always make me wish for something more, though: a budget version. While it’s nice that people who can afford a $35,000 sedan can save money at the pump, the people who need it the most are the ones shopping for $20,000 cars — or used cars. Economic reality being what it is, though, that’s not likely to change. Even at $35k, I suspect Kia may be losing money on every Optima PHEV it sells given how much high-capacity batteries and engineering cost. For people who want a premium car with one of today’s best plug-in electric powertrains, though, it’s quite a ride. With a claimed range of up to 27 miles on electric power, plus an efficient gasoline engine, the Optima PHEV is a plug-in electric car with few drawbacks. It has a premium driving feel and upscale look.